The formal Agreement between the Faculty of Archeology Cairo University, Giza, Egypt, represented by Prof. Dr. Alaaeldin Shaheen and University of Wrocław (address: 50-137 Wrocław, pl. Uniwersytecki 1, Poland), represented by Vice-President Prof. Dr. Krzysztof Nawotka was signed on April 7, 2008 (Agreement # UWr. 416/08.0014, 21.04.2008). 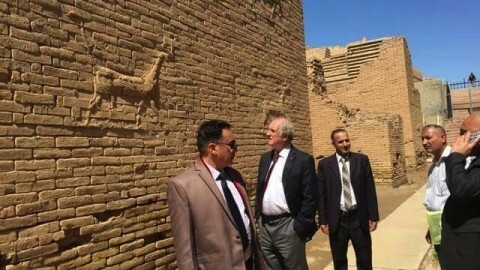 The Agreement was about the scientific research cooperation between two Universities with respect to research at the Hawara Necropolis area by the mud-brick pyramid in Hawara (Fayum) region in Egypt (Photo. 1). 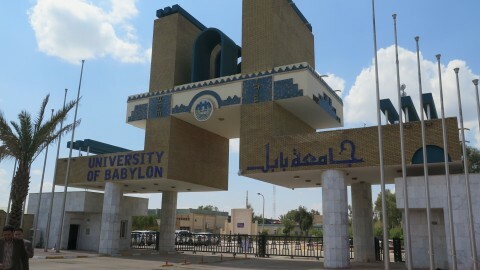 It was agreed that the Research Coordinator for the Faculty of Archeology of Cairo University will be Prof. Dr. Mohammed Abdel-Hady (from this Faculty) and the Research Coordinator for the University of Wrocław will be Dr. Adam Szynkiewicz from the Institute of Geological Sciences of the Wrocław University. 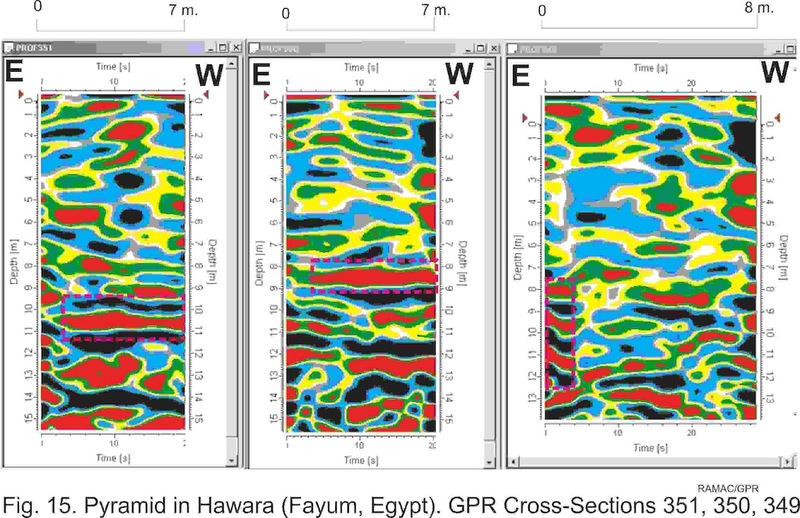 3) data of 2 boreholes made in 2008 (see: Mohamed A. Hamdan “Two Shallow Cores from Hawara Pyramid and their impact in the groundwater problem”, Geology Dep. Cairo University, 2008). 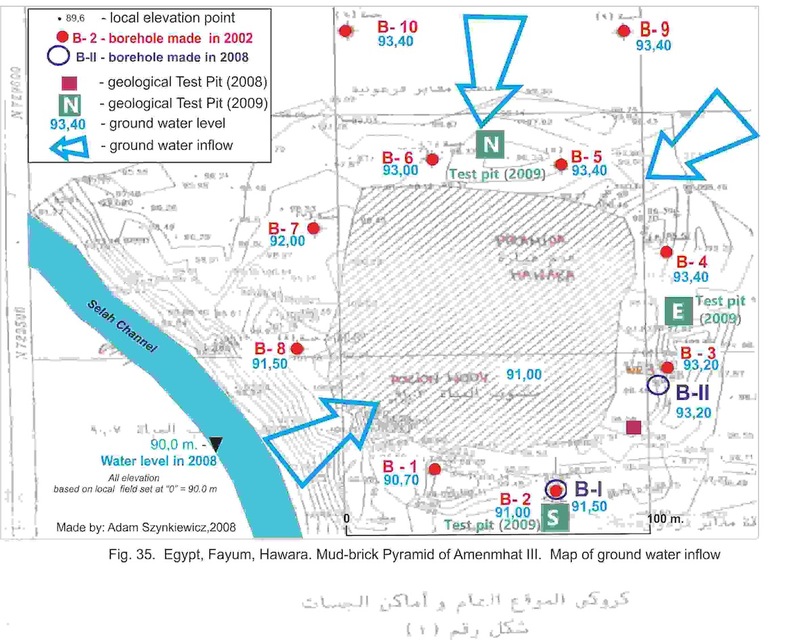 Additionally, author received samples of 2 boreholes: B-I(2008), B-II(2008) and geological Test Pit made in 2008 at the Hawara Pyramid (Report III, December 2008). In order to localize sites of research and due to a lack of more precise topographical maps, an enlarged satellite photo of the region was used (from the program: http://www.earth.google.com). One copy for the Institute of Geological Sciences of the University of Wroclaw archives. Goal and range of research. It is assumed that spaces (tombs? channels? chambers?) under the Hawara Pyramid are flooded. Therefore the Supreme Council of Antiquities granted permission to the Faculty of Archeology of Cairo University for comprehensive geophysical and possible archeological research in this area. 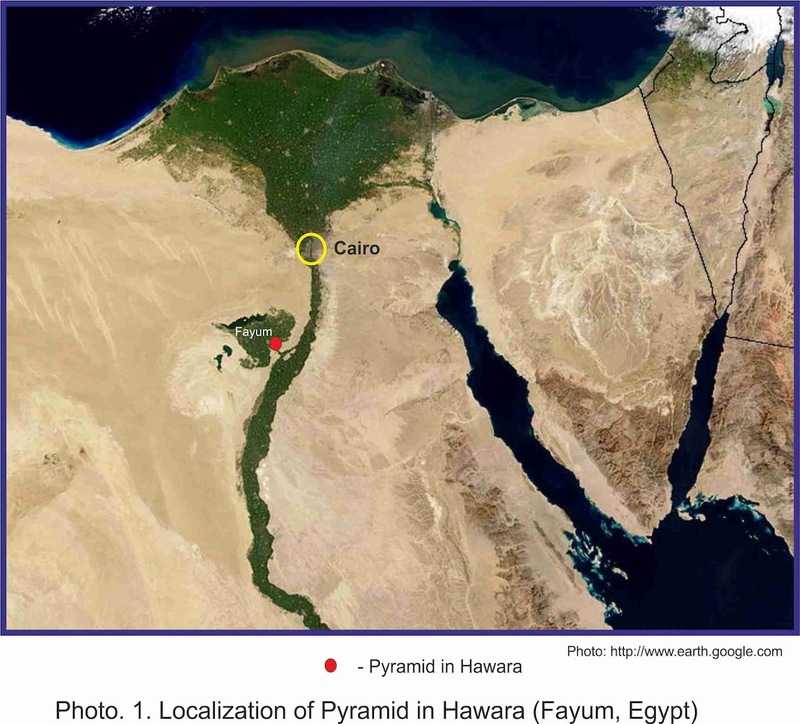 The research should firstly answer the question: Where the water in the Hawara Pyramid is coming from? In order to block or re-direct its flow more information was needed about a location of possible water supply sources (fissures? channels? underground passages? palaeo-valleys? etc.) situated in the area of the Hawara Pyramid. The whole project was divided into several stages. The first stage was to find possible direction/directions of water flow into the underground of the Hawara Pyramid. For this reason it was decided to use non-invasive research method by Ground Penetration Radar (GPR) that might indicate possible anomalies existing in the area surrounding the pyramid. 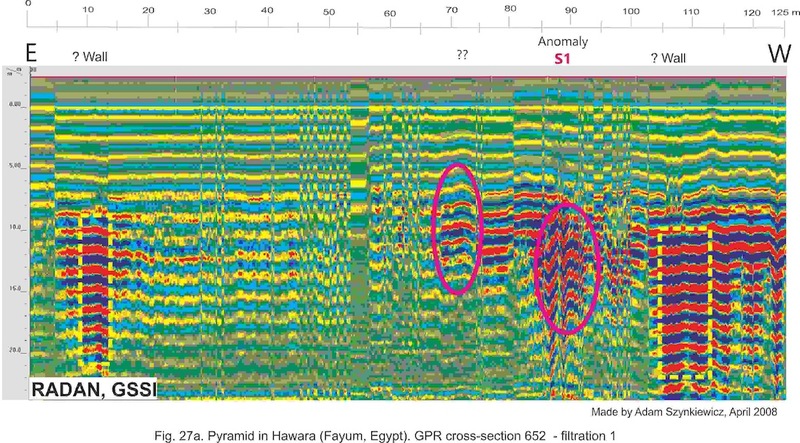 It was decided that in the preliminary stages of GPR we needed to perform several profiles around the Hawara Pyramid along the established transects. It was also decided that that the GPR monitoring should be performed to the depth of about 20 meters. The GPR research was done by two methods. 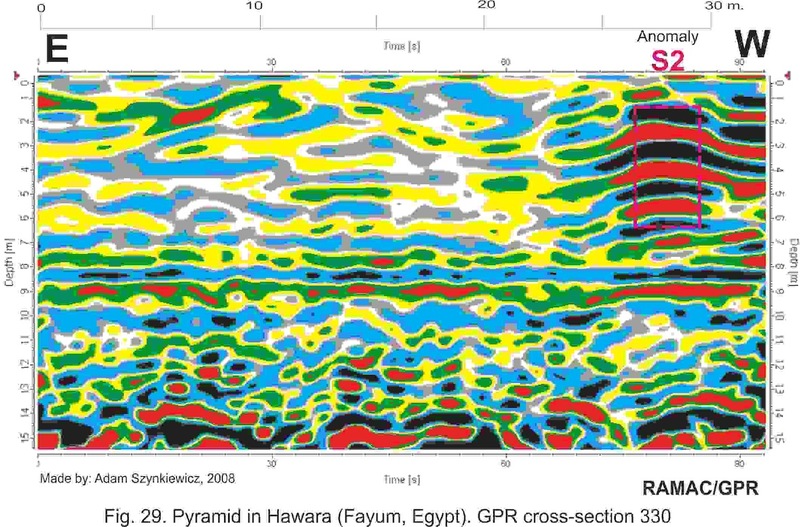 At first – around the Pyramid transects were done with GSSI system SIR with multifrequency antenna. The GPR anomalies were presented in Report I (May 2008). Next, in few places on the North, East and South of Pyramid GPR transects were done with RAMAC system with 100 MHz unshielded antenna. The GPR anomalies were presented in the Report II (June 2008). 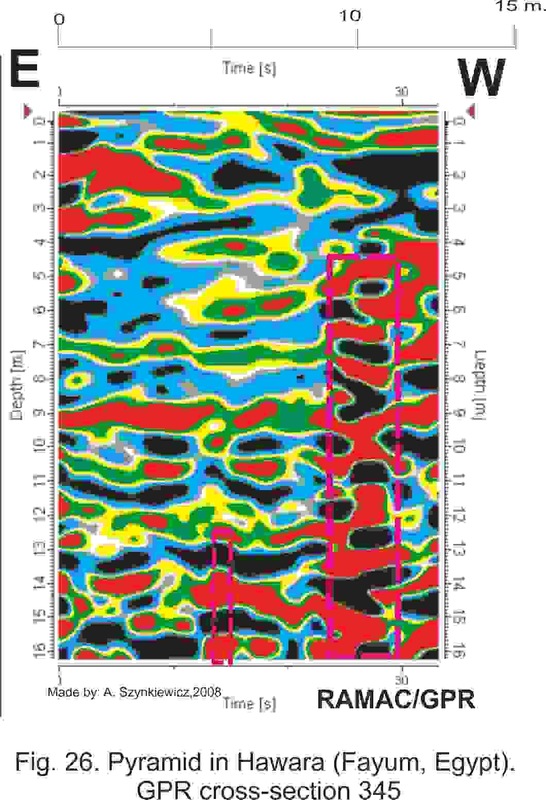 Due to the fact that in June research, localization of GPR transects were not clear – after analyses of 12 boreholes and geological Test Pit 2008 (Report III, December 2008) the reinterpretation of GPR data in this Report IV was presented. Therefore Report IV shows a new verification of Reports: Nr. I (May 2008) and Nr. II (June 2008), including geological data in Report Nr. III (December 2008). 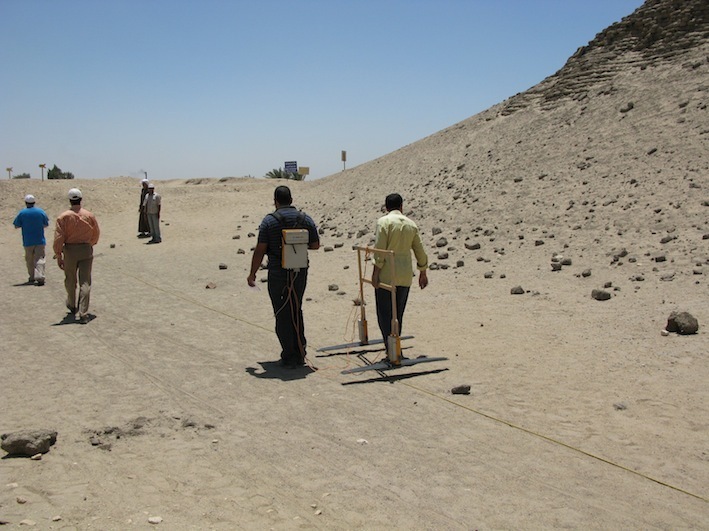 The GPR research was performed at the Fayum Oasis area (about 100 km South of Cairo, nearby a town of Hawara (Photo. 1). The Fayoum Oasis has a shape of a triangle (each side about 50 km long) with the apex directed towards North-West. Eastern side (the base of the triangle) parallel to the Nile is at the distance of 25 – 30 km from the river. The bottom terrace of the Nile is about 20 meters above sea level. The Oasis is surrounded from the South, the West and the North by plateau with the height of about 100 m above sea level. However from the North-West side of the Fayum Oasis there is an Upland of about 200 – 250 meters height above the sea level. The highlands as well as Upland is lower in the direction of the Oasis Fayum by steps with well defined borders. In the Northern part of Oasis Fayum there is a depression (up to 50 meters below the see level). Part of it consists of a cigar-shaped lake (W-E) about 40 km long, no more than 9 km wide and about 9 meters deep. Between Oasis Fayum and the Nile valley there is a Upland divided by a gorge that is about 1-2 km wide. In this gorge there is Yusef’s channel that leads to the Oasis Fayum. At the exit of this gorge to the Oasis Fayum (or by the exit from the Oasis to gorge with Yusef’s channel) on its northern side the Hawara mud-brick pyramid of the king Amenemhat III is situated (Photo. 2). The second mud-brick pyramid (king Sesostris II) is situated on the northern side of gorge near-by of the Nile valley border (El-Lahun). Both pyramids are about 10 km apart. 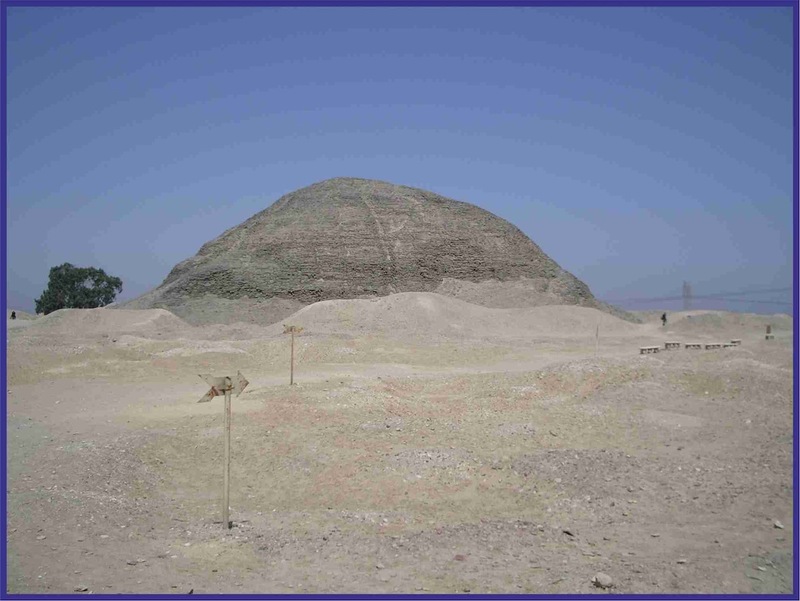 The Hawara mud-brick pyramid (Photos: 2, 3, 4) is situated on the border of an almost flat (?) terrace (? cone of palaeo-delta) with the sandy – gravel surface at the height of about 30 meters a.s.l. This surface is slightly rising towards the East and at the distance of about 6 km has a height of 35 meters above sea level. Further East there is plateau escarpment that divides Oasis Fayum from the Nile valley. Sands and gravel surrounding the Pyramid reach a thickness of (??) 3-5 meters (verbal information from the Faculty of Archeology in Cairo staff members). Under these sands there are Eocene laminated clayey – mud deposits, lake in origin (the thickness near Hawara Pyramid is 12 – 15 m and surface eroded). Further down are Eocene limestone deposits. 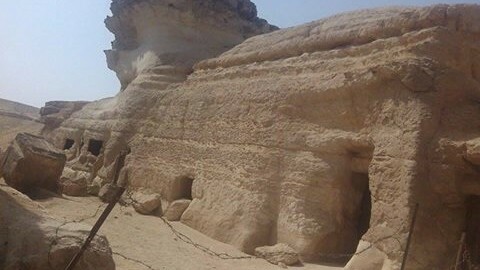 On the South-West and West side of the Hawara Pyramid there is an artificial Selah (Bahr Wabach) Channel over 5 meters in depth below the ground surface (Photo. 2). This artificial channel is conducting water from the Yusef’s channel towars the north. Nearby the Pyramid, about 200 meters east, there is a wet depression used for farming (Photo. 2). In the direction North and East from the Pyramid, on the referenced earlier sand surface there are small, shallow depressions seasonally filled with salted water. Several salt and gypsum efflorescence/minerals/cristals are clearly visible in the surrounding. About 2 km East of the pyramid there is a dry North-South valley depression. Around the pyramid at the distance of about 20 meters are earth embankments made up to the height of about 5 – 10 meters (Photo. 3). South of the pyramid, at the area named: „TEMPLE“ there are traces/signs of former archeological excavations (Photo. 2). There are also several traces/signs of archaeological excavations and diggings on the North and the East sides of the Pyramid. Autor of this Report has no original detail topographic map of Hawara Pyramid area. 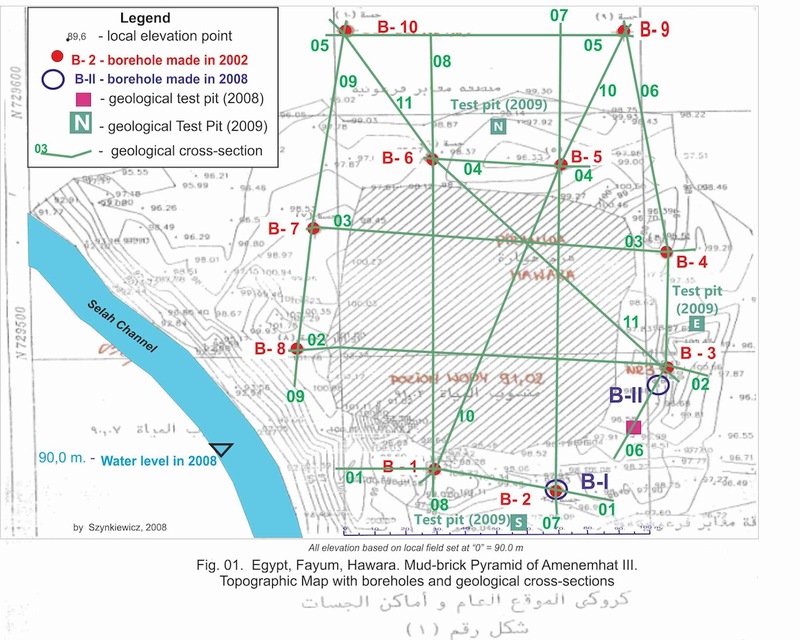 All geological analyses was made according to schematic topographic map from documentation of Ain Shams University, Faculty of Engineering, Soil Mechanics and Fundation Lab. 2002, concerning local level system (Fig. 01). All elevations on this map refer to water level in the Selah (Bahr Wahbah) Channel at level 90 m. This level is perhaps on an elevation ca 25 m a.s.l. (according to Topographic Map 1:25 000, sheet 72/600 Egypt “El-Lahun”). geological cross-section: 01 – 11, too (Report II, June 2008). 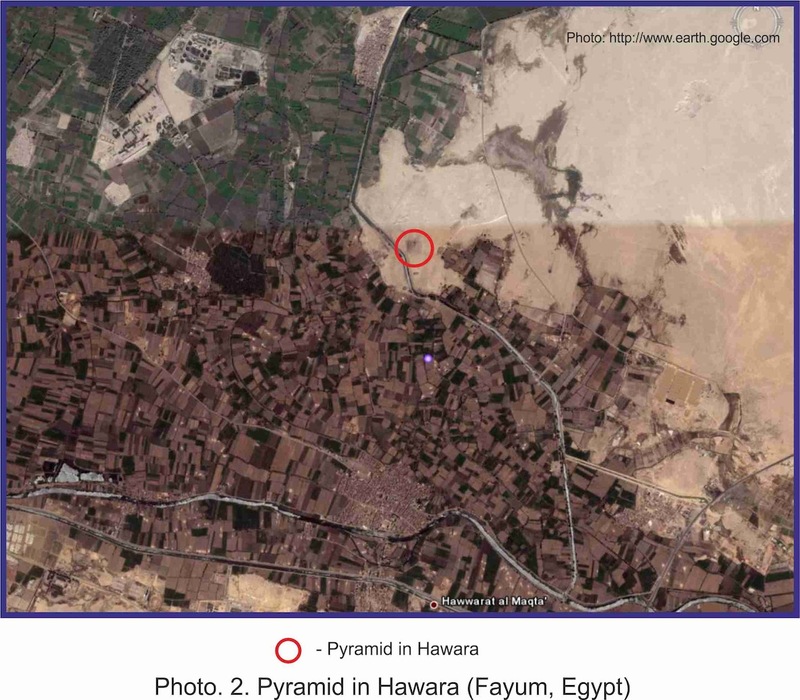 Surrounding the Hawara Pyramid are 12 boreholes, mainly up to 15 m depth (see: Report III, December 2008). One borehole (B-7/1 and B-7/2 from 2002) was drilled up to max. depth of 25 m and one borehole (B-I/2008) up to 18 m depth. Elevation of boreholes is not clear (see: Report III, December 2008). After geological analysis of borehole data the lithological units was distinguished. Perhaps at the depth ca 12 m below water level in Selach Channel are Eocene limestone (unit 1). Over this deposit are claystones/mudstones with intercalation of sandstones (2a) and in lower part with limestones intercalations. On the top of unit 2 are pure claystone/mudstone (2b). Perhaps unit 2 is also Eocene in age. Surface of deposits unit 2 are on different levels: from 89 m (in B-1.2008) up to 93 m (in B-9/2002). It was very difficult to make a decision if unit 3 is a natural layer or mound (mixed: clay, silt and mud), because description was not clear. It was named 3 (as a mound), if deposits were found at ground water level. Unit 4 was found only in one borehole (B-1/2008). It was described as fine sand. Over those described deposits was sand with gravels (5). Around the Hawara Pyramid sand and gravel was found, marked on geological maps as (?Quaternary) Nile terrace. An open question is about unit 5 (marked on borehole B-4/2002 and B-5/2002). Are these really river gravel deposits or it’s mound with such gravel (as unit 8). Unit 6 mound is built by mixed: sand, gravel, clay and fragments of stones. In borehole B-2/2002 there are fragments of stones (6a) and mixed: sand, gravel with fragments of stones (6b). In boreholes B-1/2002 and B-7/2002 it is difficult to separate sand and gravel from stone (mixed). Unit 7 there are plates/slabs of stones. The fragments of such stones are marked as unit 7a. Unit 8 – is anthropogenic surface layer, built by mixed: fragments of stones, gravel, sand and artifacts. After the analysis of boreholes it was clear that below anthropogenic deposits, around the Hawara mud-brick pyramid, were consolidated claystone/mudstone rocks (perhaps Eocene in age) which thickness can be up to 15 – 17 m. From the West, North and East side of the Hawara pyramid the surface of these rocks (claystone/mudstone) are 1 – 3 m above water level in Selah Channel. But, on the South side of the pyramid the surface of claystone/mudstone is 0,5 –1,0 m is below water level in Selah Channel. Below these claystone/mudstone are Eocene limestones. 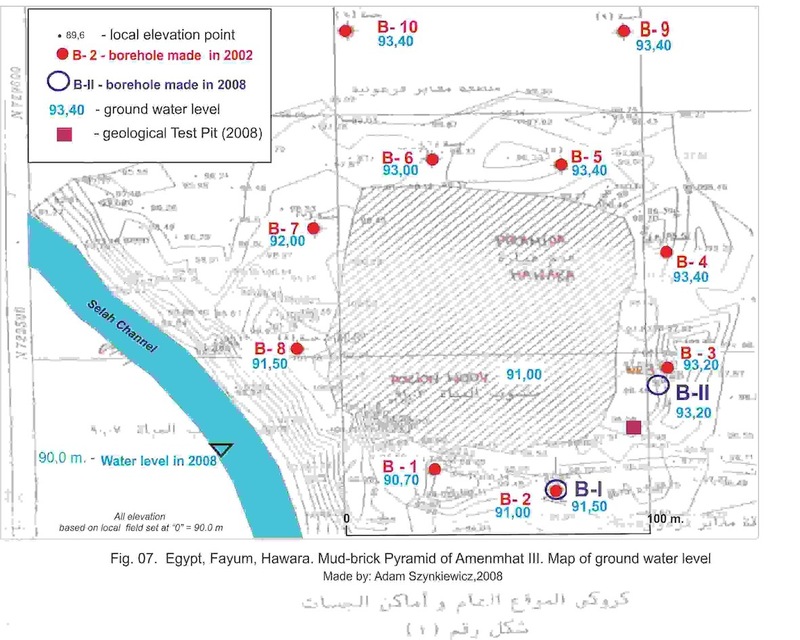 Results of geological interpretation of boreholes are shown on schematic geological cross-sections for Hawara pyramid area. The geological cross-sections are in schematic without horizontal scale. 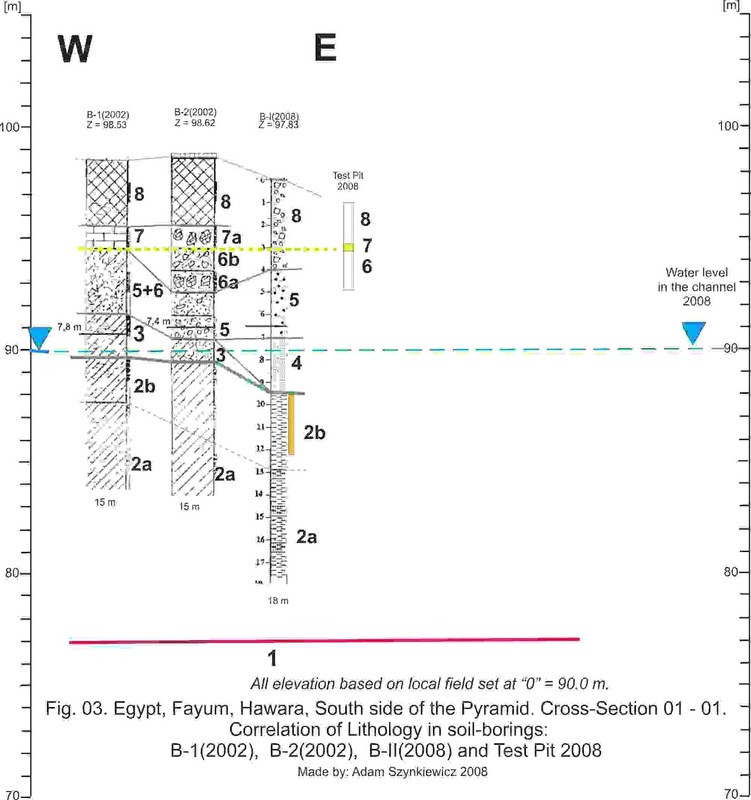 Geological Cross-Section: 01 – 01 (B-1/2002 – B-2/2002), South side of pyramid (Fig. 03). The consolidated rocks of unit 2 are ca 0,5 – 2,0 m below the water level in Selah Channel. Ground water level in boreholes are in sand or mound deposits ca 0,7 m (B-1/2002), and ca 1,0 m (B-2/2002 & B-1/2008) over water level in the channel. 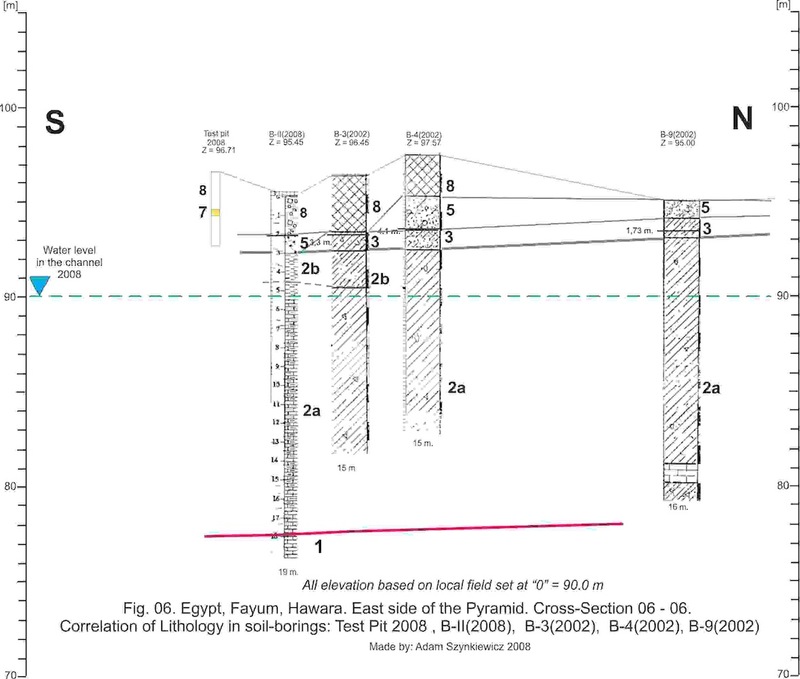 Geological Cross-Section: 04 -04 (B-6/2002 – B-5/2002), North side of pyramid (Fig. 04). On the North side of Pyramid, the consolidated rocks of unit 2 are ca 1,0 – 2,0 m over the water level in Selah Channel. Ground water level in boreholes B-5/2002 and in B-6/2002 is ca 3,40 m over water level in the channel. Geological Cross-Section: 05 -05 (B-10/2002 – B-9/2002), North side of pyramid (Fig. 05). About 80 m North from the pyramid, the consolidated rocks of unit 2 are ca 1,5 – 3,0 m over the water level in Selah Channel. Ground water level is ca 3,40 m over water level in the channel. 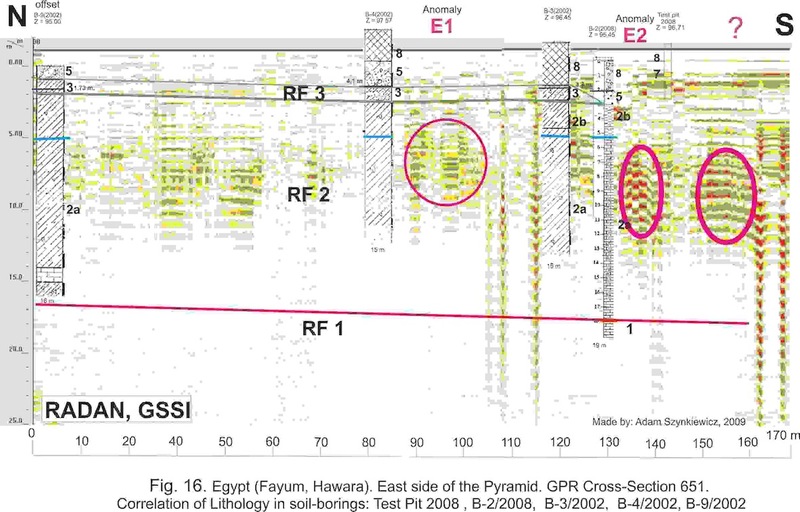 Geological Cross-Section: 06 – 06 (B-9/2002 – B-4/2002 – B3/2002 – Test Pit 2008), East side of pyramid (Fig. 06). On the East side of Pyramid, the consolidated rocks of unit 2 are ca 2,0 – 3,0 m over the water level in Selah Channel. Ground water level is ca 3,2 m – 3,40 m over water level in the channel. The geological structure of the youngest layers, including anthropogenic embankments after drilling, was not clear. Drill data was not adequate for interpreting GPR data. For this reason, at the first stage of the research it was decided to dig control geological excavations (Geological Test Pit). 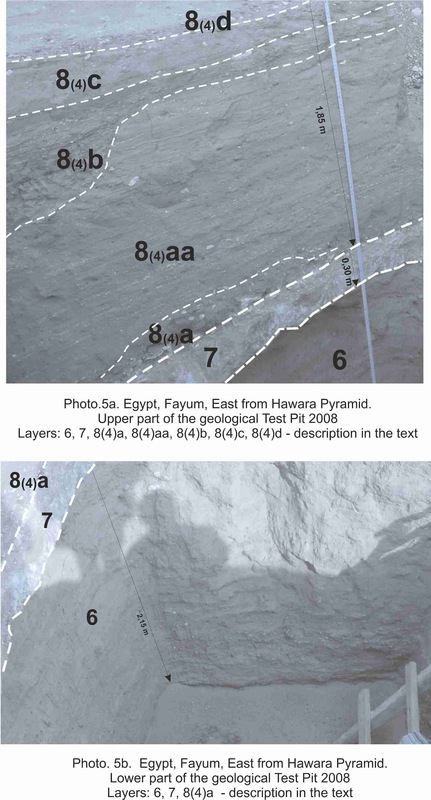 The first geological Test Pit was excavated in 2008 at the SE corner of Pyramid, ca 20 m South from B-2/2008 and 75 m East of the entrance to the Hawara pyramid (Fig. 01). Excavation was performed at area ca 4 m x 4 m, up to 4 m depth. The geological Test Pit2008 shows structure of units: 6, 7 and 8. The unit 7 built with limestone slabs with thickness of 0,30 m., on the depth ca 2 meters (see: Fig. 2). 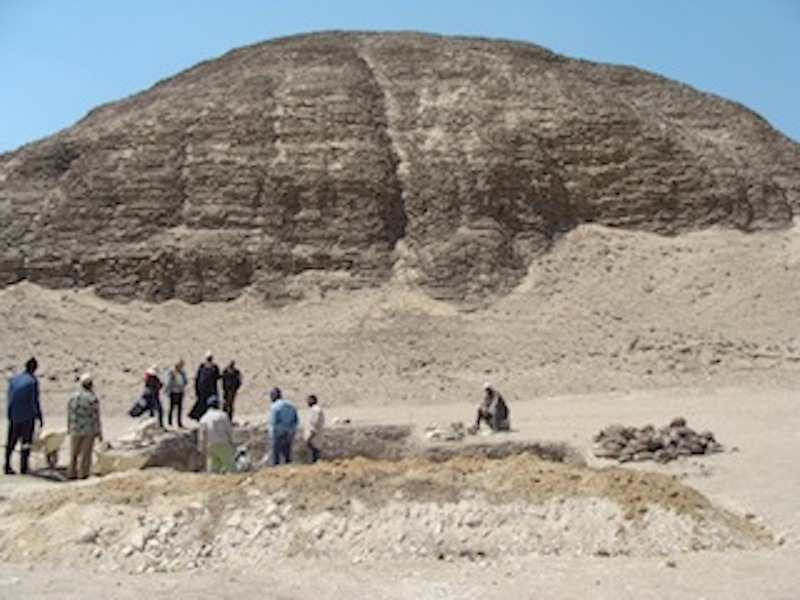 An application was made to allow few other control geological excavations to identify the layers in the pyramid’s surroundings. 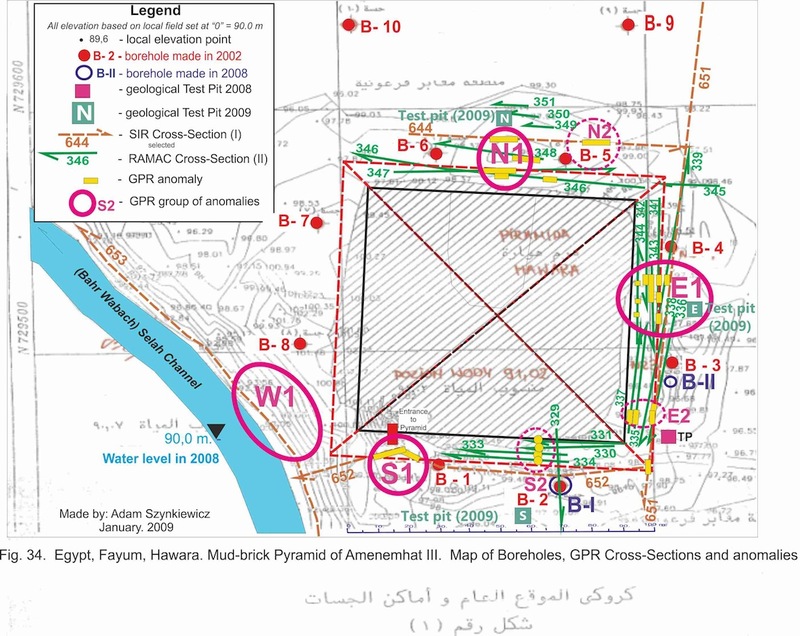 Permission was obtained and in 2009 were made three geological excavation (Geological Test Pits): E – east of the pyramid, N – north of the pyramid. 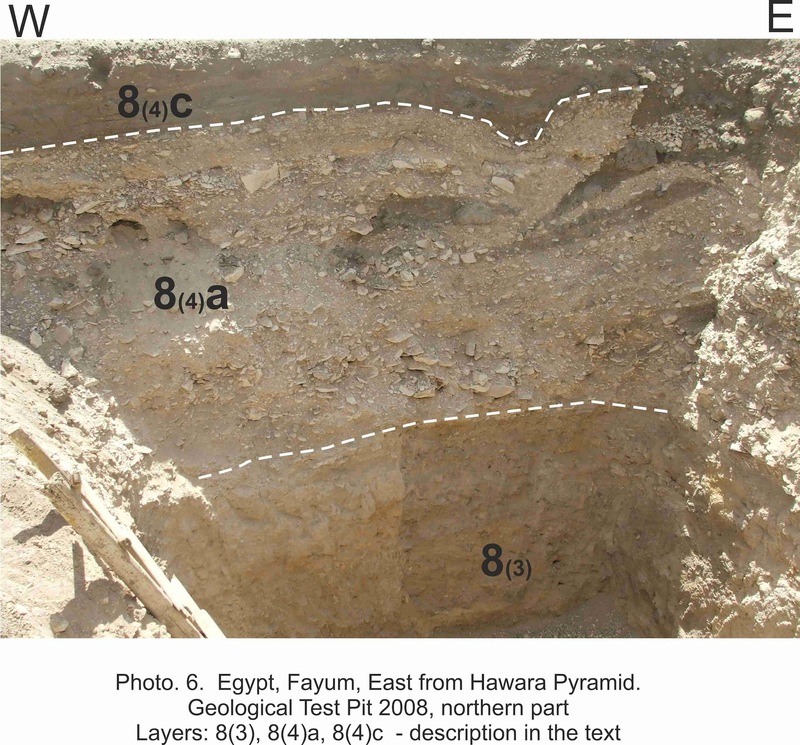 Geological Test Pit (E) – about 25 m east from the middle part of East side of the pyramid (Fig. 01 and Photo. 4a and 4b). Excavation was done at area 5 m x 3 m, up to 4,3 m depth. The geological Test Pit E shows detail structure of units: 6, 7 and 8. The unit 7 built limestone slabs which has thickness 0,30 m. Below this slab are deposits of unit 6, built by gravel and brownish sand with the rest as flora and artifacts. It is anthropogenic in origin but washed by water. Over the slab are layers of unit 8 (Photo. 4a, Photo. 4b and Photo 5a, 5b). This unit is not homogeneous. At the bottom (above the plates) it builds a layer of limestone fragments mixed with sand and gravel and a few fragments of ceramics (8(4)a on Photo 5a and Photo. 6). The next layer (8(4)aa on Photo 5a) is built by gravel and sand with the rest flora (8(4)a and. This anthropogenic deposit was washed by water. On the top of this sequence are small channels filed by mud (8(4)b). Over them are sand with gravels (8(4)c) and mixed gravels, sand and artifacts of mound surface (8(4)d or 8 not separated). 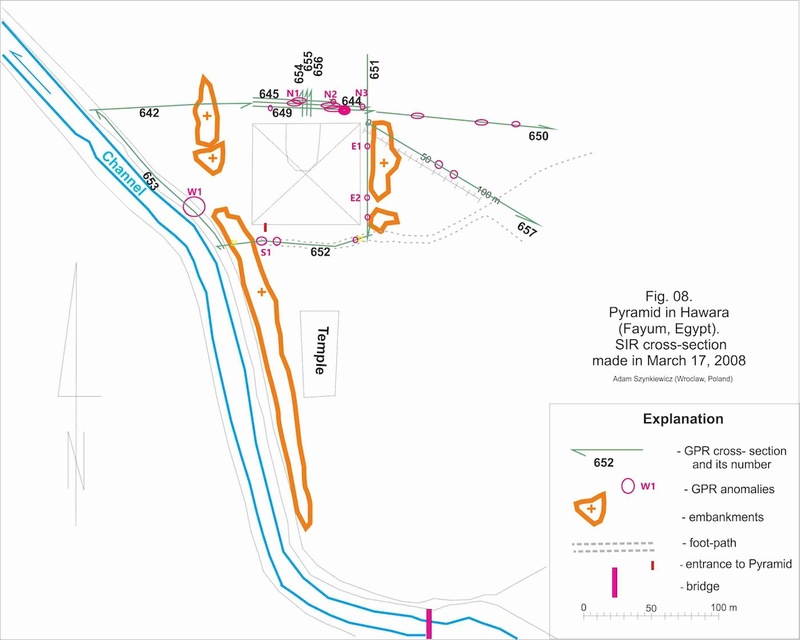 Geological Test Pit (N) – about 25 m north from the middle part of North side of pyramid (Fig. 01). 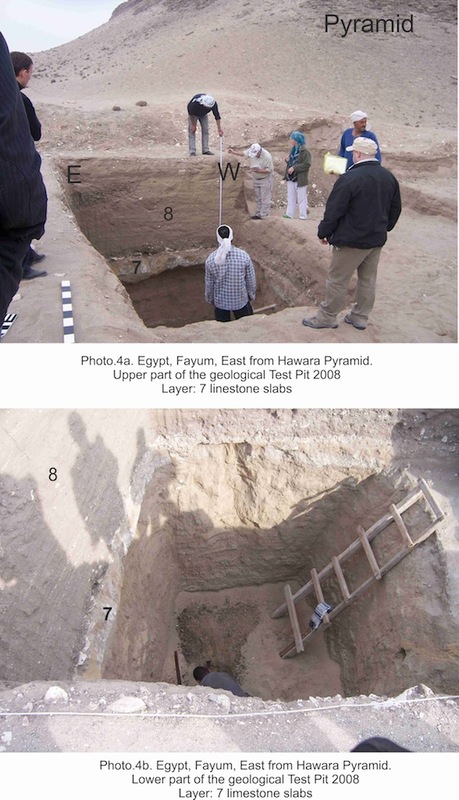 Excavation was done at area 6 m x 5 m, up to 4 m depth. The geological Test Pit N shows detail structure of units: 3, 6, 7 and 8. The unit 3 built dark-brown clay with remains of flora. Perhaps it’s shallow lake deposits from the age of Holocene. The unit 6 built laminated brown sand with rest of flora. Locally, above the unit 6, the Holocene deposits (heap), moved by man, on which laing limestone slabs (unit 7). The unit 7 (limestone slabs) has thickness 0,30 m. Over the slab are layers of unit 8 (Photo. 7). This unit is not homogeneous, and is different from deposits on East side of piramid. Lower part consisted of moved Eocene clay deposits (8(1)). Above appear laminated sandy-clay lake deposits, from the age of Holocene (8(2)). These layers are cleaved and in the local depressions are mixed Eocene deposits (8(3)). The next layer is built by gravel and sand with the rest flora (8(4)). This anthropogenic deposit are marked 8(4) on Photo 7. 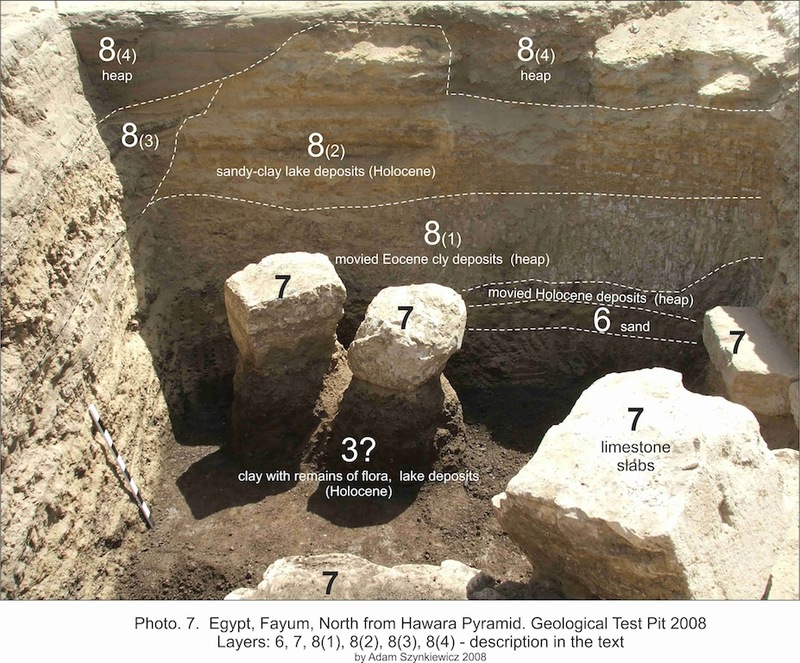 Geological Test Pit (S) – about 25 m north from the middle part of South side of pyramid (Fig. 01). Excavation was performed at area 6 m x 5 m, up to 2.5 m depth. In the mixed sand with the grains of the unit 8 numerous fragments of ceramics and fragments of sculptures were found. The excavation was stopped because it was recognized that this area might be defined as the area of a temple. 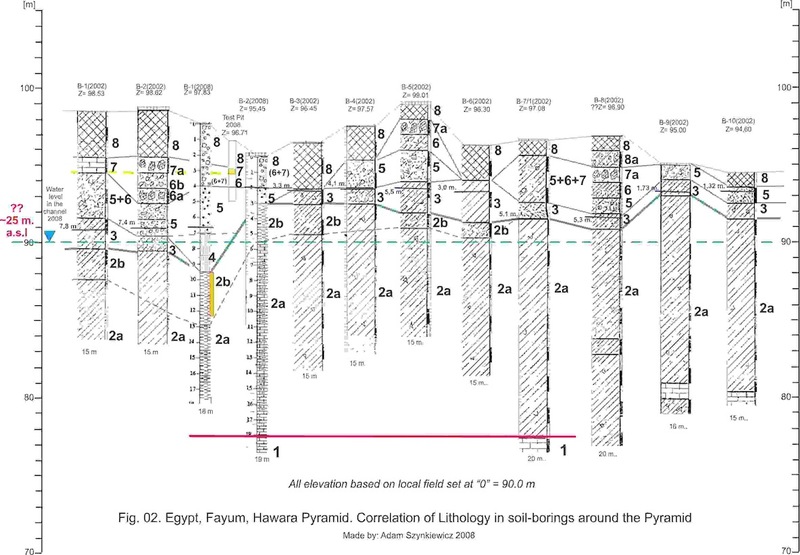 The results of analysis data from boreholes and Test Pit is known that on the North and North-East side of pyramid the first ground water level is ca 3,4 m over the water level in Selach Channel (Fig. 07). On the East side ground water level is ca 3,2 m over the water level in Selach Channel. On the West side ground water level is (??) on 1,5 – 2,0 m over the water level in Selach Channel. Below pyramid the water level is ca 1,0 m over the water level in Selach Channel. On the Southside ground water level is ca 1,5 m (in E part) and 0,7 m (in W part). The Selah Cannel controls the ground water outflow. The existance of the ground water in borehole B-II/2008 is very interesting. The ground water level during boring was very low, but at last steady at 2 m below surface. The boring was stopped in limestone and perhaps the lower/second ground water level in limestone unit (1) was disturbed. General dipping of limestone layers is from E or NE to W or SW and ground water aquifer alimentation is located East or NE from the pyramid on (?) Upland. For this reason at the pyramid area the ground water in limestone (unit 1, see: Fig. 02) are under pressure (karst artesian water). It could be very interesting if some control of this water level would be possible. Perhaps karst artesian water from limestone (unit 1) is in fact not the one flooding chumbers/channels/tomb below Pyramid. – portable computer with a monitor (or only with a special monitor). These elements are connected with optic fibers or with cables. The instrument is functioning on the base of calculating delays of electromagnetic, high frequency impulses that are emitted by Tx antenna, and bounced in different underground lithological surfaces and are received by the receiving antenna (Rx). Than they are directed to the central unit in order to calculate the delay of the returning electromagnetic wave (impulse). By bouncing the signal „borders“ we understand borders between different rocks/ground with different dielectric constant. Rocks/grounds/stones have different value of dielectric constant. Impulses sent into the ground by Tx antenna come back with a delay to the receiving antenna (Rx) and then though optic fibers/or cables they are directed the central unit. The received data is worked over and sent to the computer’s hard disc (register). An observer in the field is monitoring these impulses in the form of a radargram/radiogram (waves time picture as a line vertical cross-section of lithological changes in ground). Such scans must be than filtered and can be printed in different colors (a separate color for each wave speed). Obtained picture can be than compared to different models from other research or with model picture of other structures and with a data received from drilling or from excavation. GPR instrument are usually used for testing sites from the ground surface. In comparison to other methods the GPR tests allow to follow a linear geological structures of the ground, i.e. to observe cross-section changes of lithology and ground structures. Different multi-frequency antennas (from 10 MHz to 2GHz) can be used depending on the predicted task and the depth in the monitored area. The lower is the frequency of antennas the deeper profiles can be done but also less precise information of shallow areas of the monitored sites. For engineering purposes and a shallow archeological research shielded (screen-protected) antennas are used. II – on May 2008 (see: Report II, June 2008). 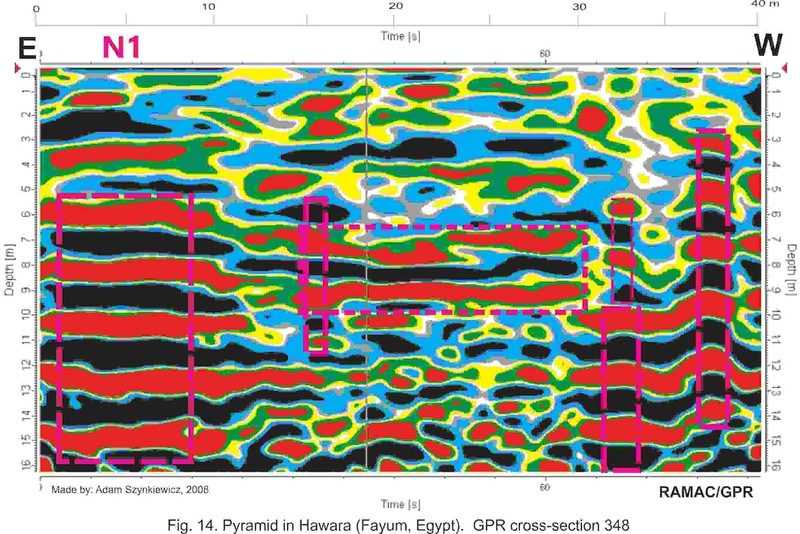 I: The GPR on-site research at the Hawara Pyramid area was done on March 17, 2008. For the ground penetration tests the US build SIR equipment, produced by GSSI (battery powered) was used with the multi-frequency antennas with theoretical penetration up to about 25 m deep. The antennas were carried at the level of about 20 – 40 cm above the ground surface along pre-determined lines (Photo. 8). The signal’s interval was measured by time. The distances of transects were measured by measured calibrated line, The operating technical team of the SIR-2 equipment were members of the NRIAG Cairo staff under the supervision of Dr. Ashraf Khozym Salama (Cairo, Egypt). There were 12 transects measurements done. Localization of all transects was not clear and marked on the map (Fig. 08) within a precision of + 10 meters. 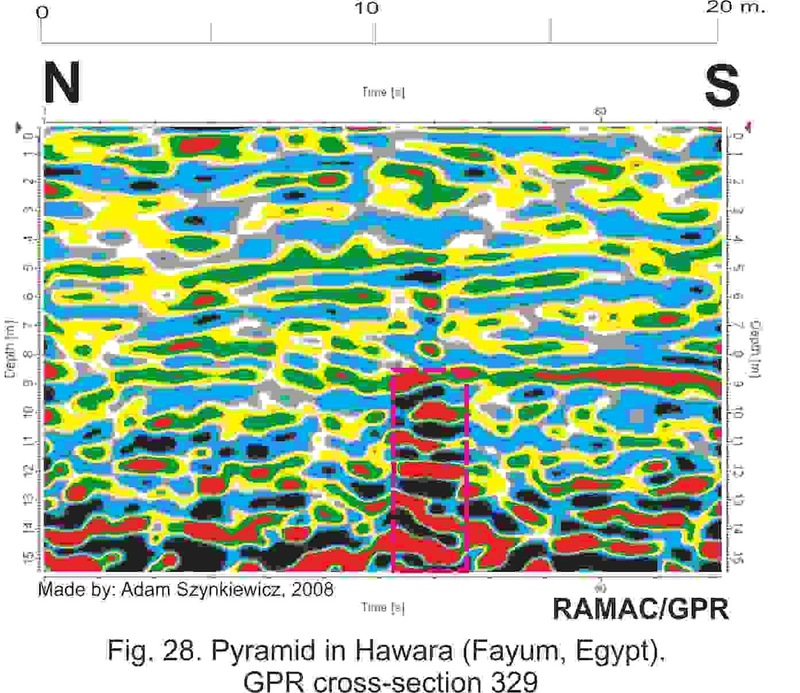 II: The GPR on-site research II at the Hawara Pyramid area was done on May 23-25, 2008. For the ground penetration tests the RAMAC/GPR equipment, produced by Sweden Mala GeoScience (battery powered) was used with the 100 MHz antennas with theoretical penetration up to about 15 meters. The antennas were carried at the level of about 10 – 30 cm above the ground surface along pre-determined lines (Photo. 9). The signal‘s interval was measured by time and GPS. The distances of transects were measured by measure calibrated line. The operating technical team of the RAMAC/GPR equipment were members of the Geology Department University of Cairo staff under the supervision of Dr Adham Rafaie (Cairo, Egypt). There were 22 transects measurements done. Localization of all transects is not clear and marked on the map (Fig. 09) within a precision of + 10 meters. 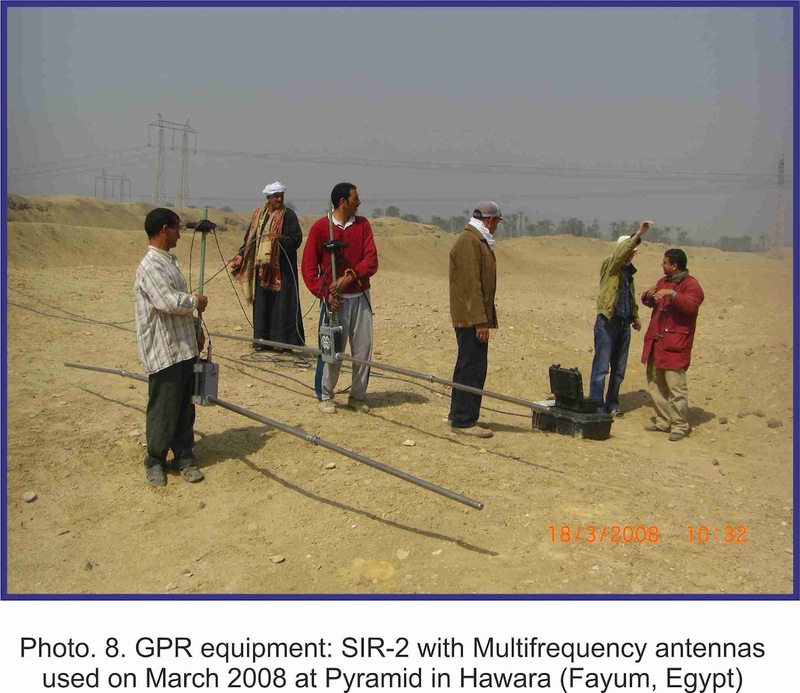 PHOTO 9, RAMAC/GPR with 100 Mhz antenna used on May 23-25, 2008 at Hawara pyramid area. As the result of the on-site tests the GPR files with initial reflex/echo data time radargrams/radiograms were received and were written down on the computer‘s hard disk of the main unit. At the office these files were than transfered to a stationary computer and subjected to a filtration process using programs: I) to GSSI RADAN 6.5 and REFLEX W (see: Report I, May 2008) to MALA GroundVision (see: Report II, June 2008). For the data analysis different combination of filters were used that produced different synthetic pictures of echo’s of reflected electromagnetic waves. After selecting the right filters and after obtaining the correct optimal pictures that could be interpreted and could give answers to main questions these files were exported to the program CorelDraw. On this program the directions were marked (South, North, or East, West) as well and noticed anomalies. 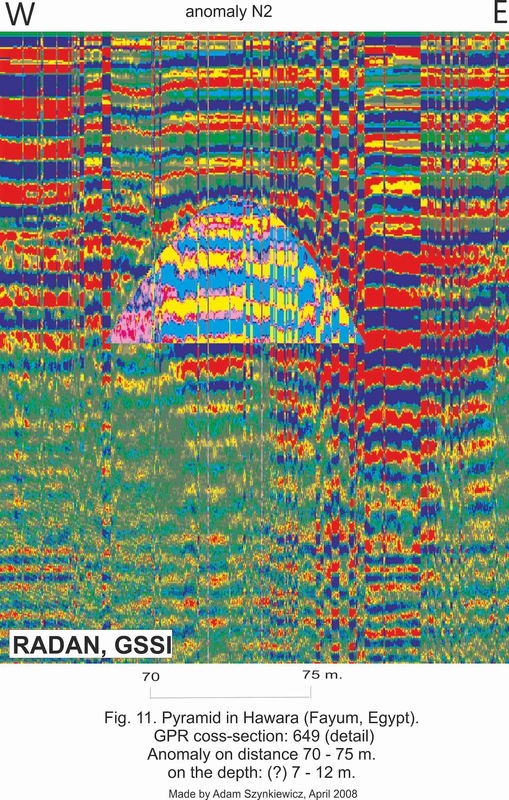 Anomalies on the radargrams/radiograms are marked by pink ellipses or rectangle. In such manner the GPR 2D cross-sections were created. On some radargrams/GPR Cross-Section different EM fields of different lithological types (which named as radar facieses RF) were marked as: RF 1 – it is a limestone; RF 2 – clayey / mud like deposits (RF 2a – with sandstone intercalation, RF 2b – pure claystone); RF 3 – it is clayey overburden made by man activity; FR 4 and RF 5 – it is sand and sand with gravels; RF 6 – mound, mixed sand, gravels with artifacts, FR 7 – constructions (? ); RF 8 – mixed gravels, sand and artifacts of mound surface. Predicting borders between radar-facieses (RF) were marked with black lines, green lines or white lines. In such manner the GPR 2D cross-sections were created. Due to lack of precise geological data for calculating the scale for the penetration depth it was decided to adopt a medium velocity of soils value of „100 m/us“. For this reason the scale of the depth in not precise and an error in depth calculation can be in the range of + 2 meters. The cross-sections are elevated! 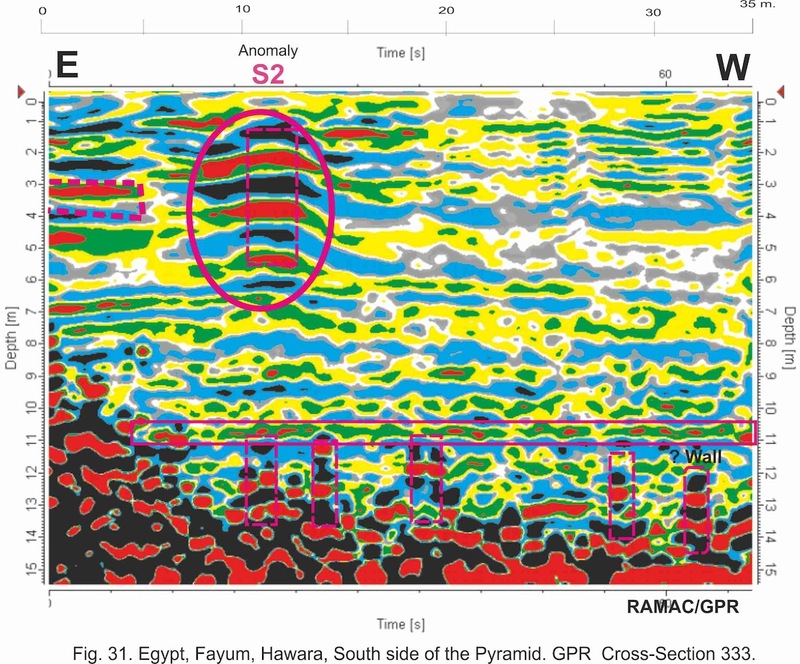 Note: All GPR measurements in 2008 were done before the removal of sand heaps in the eastern and northern surroundings of the pyramid. For this reason, the depth of anomalies and highlighted lithological units are now different than the depth scales shown in the GPR sections. GPR Cross-Section 644 (Fig. 08 and Fig. 10). Cross-Section East – West made SIR-2 with multi-frequency antenna. On the basis of boreholes: B-6/2002 and B-5/2002 are marked radar – facieses (RF). Noticed anomalies were between: 25 – 35 meters (strong anomaly N1), 52 – 65 meters (strong anomaly N2) and 78 – 81 meters (anomaly N3). The small anomaly at a distance of 70 m cross-section 644 was also confirmed in cross-section 649 (see fragment of cross-section on Fig. 11). With other filtration it is clearly visible. At the present stage of research it is difficult to determine what that might be. Perhaps it is a tomb, but it is not excluded that it is some underground passage, void ?, tunnel? GPR Cross-Section 346 (Fig. 08 and Fig. 12 ). Cross-Section East-West, on North side of the Pyramid, parallel to the pyramid’s base, made RAMAC/GPR with 100 MHz unshielded antenna. The boreholes: B-6/2002 and B-5/2002 are marked. Noticed strong anomalies were between: 5 – 10 meters (? wall), 47 – 55 meters (very strong anomaly N1) and 78 – 81 meters (? wall). GPR Cross-Section 347 (Fig. 09 and Fig. 13). GPR Cross-Section 348 (Fig. 09 and Fig. 14). GPR Cross-Section 651 (Fig. 08 and Fig. 16). 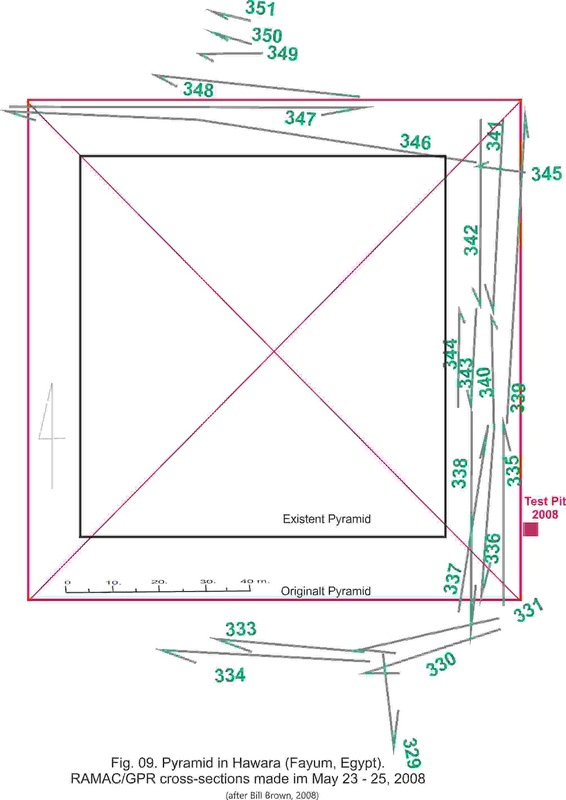 Cross-Section North-South, made SIR-2 with multi-frequency antenna on East side of the Pyramid, parallel to the pyramid’s base, between the pyramid and earth embankments (existed on March 2008). On the basis of boreholes: B-9/2002, B-4/2002, B-3/2002, B-II/2008 and Geological Test Pit 2008 are marked radar – facieses (RF). Noticed anomalies were between: 90 – 105 meters (anomaly E1), 135 – 142 meters (anomaly E2) and 152 – 160 meters (anomaly E3). At the present stage of research it is difficult to determine what that might be strong anomalies: N1 and N2. GPR Cross-Section 335 (Fig. 09 and Fig.17). Cross-Section South – North, along the estern side of Pyramid. Transect was made RAMAC/GPR with 100 MHz unshielded antenna. The boreholes: B-3/2002 and B-II/2008 are marked Anomaly E2 at a distance of 135 – 142 m on cross-section 651 was also confirmed in cross-section 335. Strong horizontal anomaly on the depth of 9 meters. GPR Cross-Section 336 (Fig. 09 and Fig.18). Cross-Section North – South, along the easten side of Pyramid. Transect was made RAMAC/GPR with 100 MHz unshielded antenna. The boreholes: B-3/2002 and B-II/2008 are marked. Anomaly E1 at a distance of 90 – 105 meters on cross-section 651 was also confirmed in cross-section 336. Strong horizontal anomaly on the dept of 9 – 10 meters. At the present stage of research it is difficult to determine what that might be strong anomaly E1. It is not excluded that kind of stone construction. 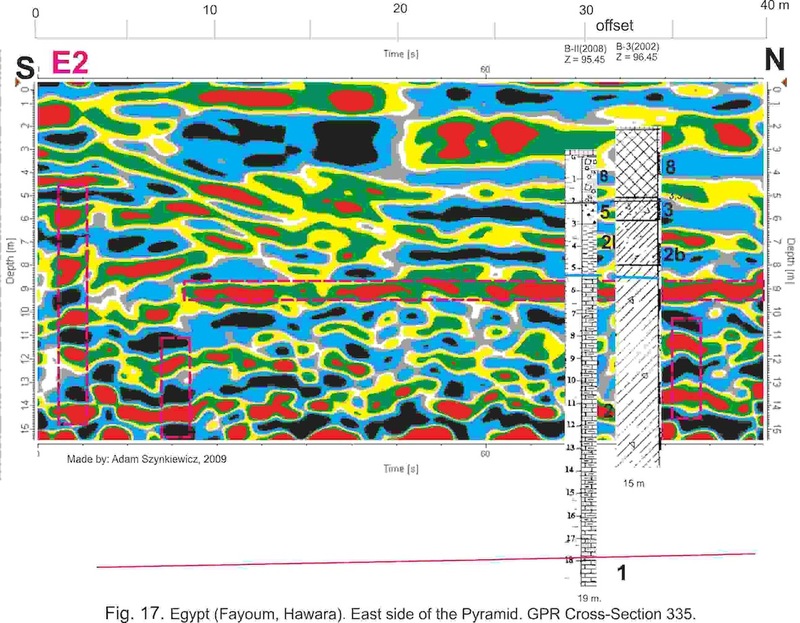 GPR Cross-Section 337 (Fig. 09 and Fig. 19). Cross-Section South-North, on East side of the Pyramid, parallel to the pyramid’s base, made RAMAC/GPR with 100 MHz unshielded antenna. Noticed confirmed anomaly E2 on distance between: 5 -7 meters. GPR Cross-Section 338 (Fig. 09 and Fig. 20). Cross-Section South-North, on East side of the Pyramid, parallel to the pyramid’s base, made RAMAC/GPR with 100 MHz unshielded antenna. The boreholes: B-3/2002 and B-II/2008 are marked and are marked radar – facieses (RF). Strong anomaly E2 on distance between: 28 – 32 meters. At the present stage of research it is difficult to determine what that might be strong anomaly E2. It is not excluded that kind of stone construction. GPR Cross-Section 339 (Fig. 09 and Fig. 21). 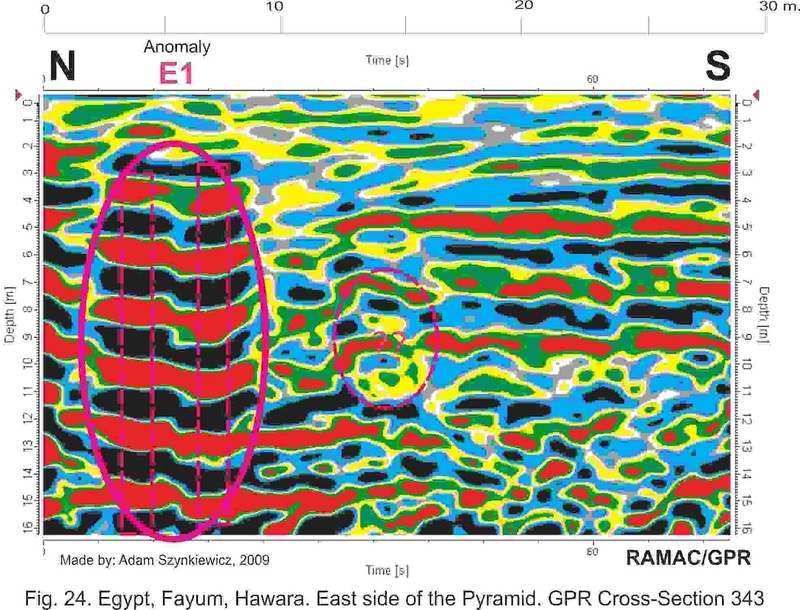 Cross-Section South – North, along the estern side of Pyramid, parallel to the pyramid’s base, made RAMAC/GPR with 100 MHz unshielded antenna. On the basis of boreholes: B-4/2002, are marked few radar – facieses (RF). Noticed that strong anomaly E1 is between: 1 – 20 m. At the present stage of research it is difficult to determine what that might be. It is not excluded that kind of stone construction with underground passage?, void ?, tunnel? . GPR Cross-Section 341 (Fig. 09 and Fig. 22). Cross-Section North-South, on East side of the Pyramid, parallel to the pyramid’s base, made RAMAC/GPR with 100 MHz unshielded antenna. Noticed anomalies were between: 2 – 8 meters (? walls), 28 – 40 meters (anomaly E1) and horizontal anomaly on the depth 9 – 10 meters. GPR Cross-Section 342 (Fig. 09 and Fig. 23). Cross-Section North – South, along the easten side of Pyramid, parallel to the pyramid’s base. Transect was made RAMAC/GPR with 100 MHz unshielded antenna. Noticed anomalies were between: 0 – 1 m meters, 18 – 20 meters (anomaly E1) and horizontal anomaly on the depth up 8 – 10 meters. .GPR Cross-Section 343 (Fig. 09 and Fig. 24). Cross-Section North-South, on East side of the Pyramid, parallel to the pyramid’s base, made RAMAC/GPR with 100 MHz unshielded antenna. Noticed very strong anomaly were between: 2,5 – 7,5 meters (anomaly E1). It is not excluded that kind of stone construction. GPR Cross-Section 344 (Fig. 01 and Fig. 25). GPR Cross-Section 345 (Fig. 09 and Fig. 26). Cross-Section East – West at North – East corner of the Pyramid. Transect was made RAMAC/GPR with 100 MHz unshielded antenna. Strong anomaly on distance 9 – 11 meters. It is not excluded that kind of stone construction. GPR Cross-Section 652 (Fig. 08 and Fig. 27a and Fig. 27b). Cross-Section East-West, from the South-East corner until the water channel on the foot-path running along the southern side of pyramid. Transect was made SIR-2 with multi-frequency antenna. Filtration 1 (Fig. 27a) – noticed anomaly were between: 7,5 – 12 meters (very strong anomaly, marked ? Wall), between: 85 – 95 meters (marked anomaly S1) and between: 103 – 113 meters (marked ?Wall). Filtration 2 (Fig. 27b) – on the basis of boreholes: B-1/2002, B-2/2002, B-I/2008 amd Test pit 2008 are marked Radar Facieses (RF). Noticed anomaly were between: 70 – 75 meters, 82 – 85 meters and 90 – 95 meters (all anomalies are marked as S1). Anomaly at 10 m is perhaps from burred wall. 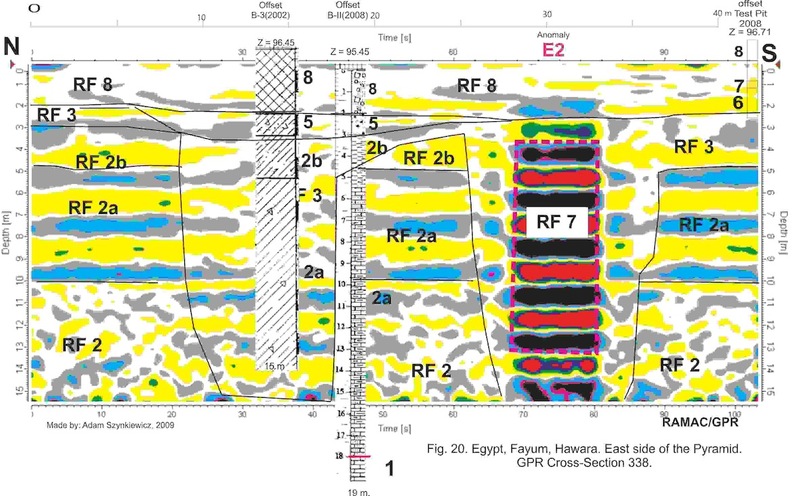 GPR Cross-Section 329 (Fig. 09 and Fig. 28). Cross-Section North – South, from the middle part of Pyramid to South. Transect was made RAMAC/GPR with 100 MHz unshielded antenna. Noticed anomalies between: 10 – 12 meters (perhaps it is a wall). GPR Cross-Section 330 (Fig. 09 and Fig. 29). Cross-Section East – West, along the southern side of Pyramid (from South-East corner), parallel to the pyramid’s base. Transect was made RAMAC/GPR with 100 MHz unshielded antenna. Noticed anomalies between: 26 – 29 meters (very strong anomaly, marked S2). Perhaps it is grave (? ), tomb (?). GPR Cross-Section 331 (Fig. 09 and Fig. 30). 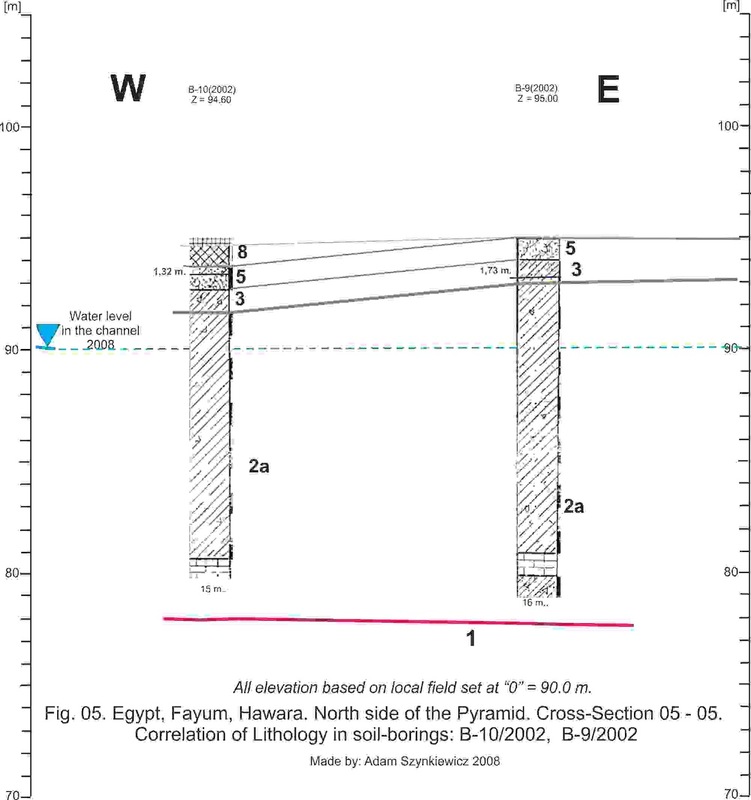 Cross-Section East – West, along the southern side of Pyramid (from South-East corner), parallel to cross-section 330. Transect was made RAMAC/GPR with 100 MHz unshielded antenna. This cross-section confirmed data from cross-section 330. Noticed anomalies between: 23 – 25 meters (very strong anomaly, marked S2). Perhaps it is grave (? ), tomb (?). On the depth ca 8 – 9 meters is horizontal anomaly. GPR Cross-Section 333 (Fig. 09 and Fig. 31). 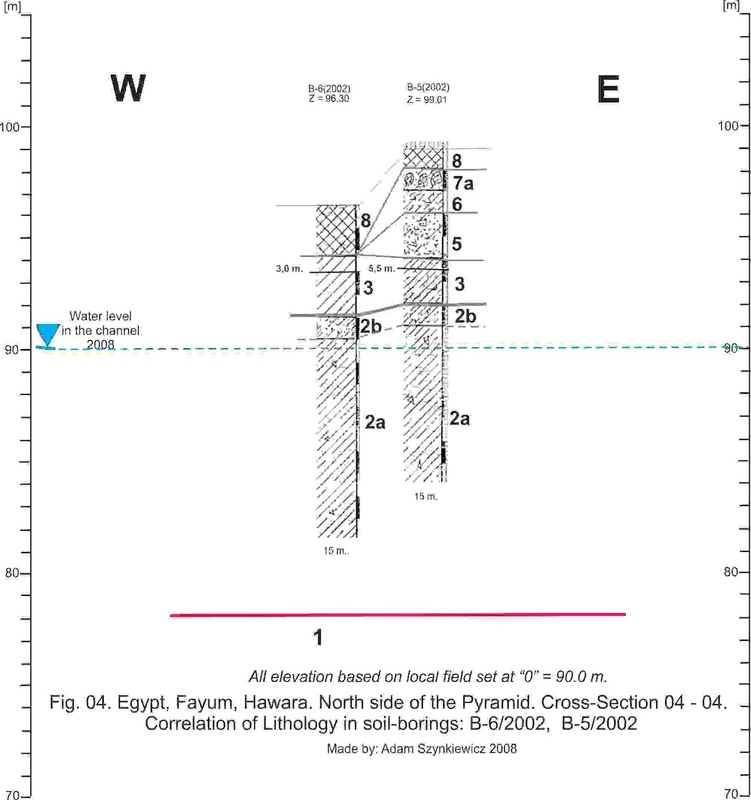 Cross-Section East – West, along the southern side of Pyramid, , parallel to the pyramid’s base. Transect was made RAMAC/GPR with 100 MHz unshielded antenna. Noticed anomalies (on the depth 1,5 – 5,5 meters) between: 10 – 12 meters (very strong anomaly marked S2). Below surface, on the depth 10 – 11 meters are few interesting anomalies between: 11 m, 13 m, 18 m, 28 m, and 32,5 meters. On the depth ca 10 – 11 meters is horizontal anomaly. 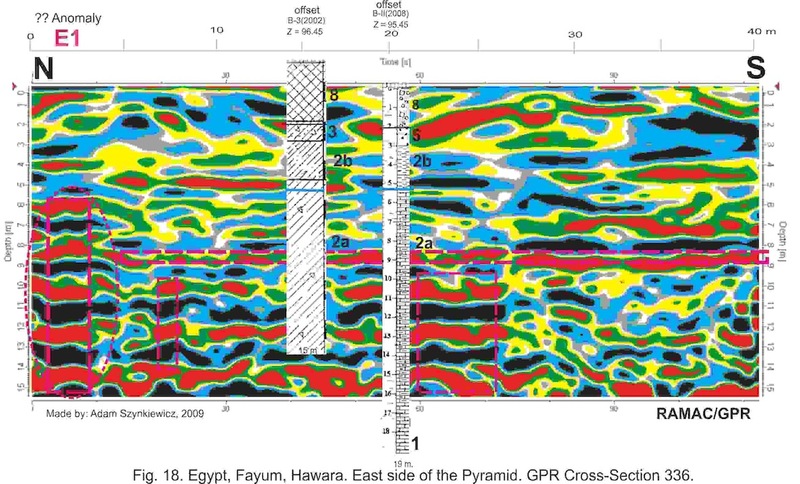 GPR Cross-Section 334 (Fig. 09 and Fig. 32). Cross-Section East – West, on South side of the Pyramid, parallel to the pyramid’s base, made RAMAC/GPR with 100 MHz unshielded antenna. On the basis of boreholes: B-1/2002, B-2/2002, B-I/2008 are marked radar – facieses (RF). Noticed anomalies are between 8 – 12 meters (very strong anomaly marked as S2). This cross-section confirmed data from cross-sections: 330, 331, 333. Noticed anomalies are between: 8 – 12 meters (very strong anomaly, marked S2). Perhaps it is grave (? ), tomb (?). GPR Cross-Section 653 (Fig. 08 and Fig. 33). Cross-Section South East – North West, along the western side of pyramid, from the South-West corner along the water channel. Cross section was made SIR-2 with multi-frequency antenna. It marked the Radar Facieses (RF) and W1 anomaly. Anomalies marked as W1 are probably echoes of the ruined walls surrounding the pyramid and the empty space between the destroyed walls. Perhaps the destruction of the walls surrounding the pyramid could have occurred while digging the Salah Cannel. 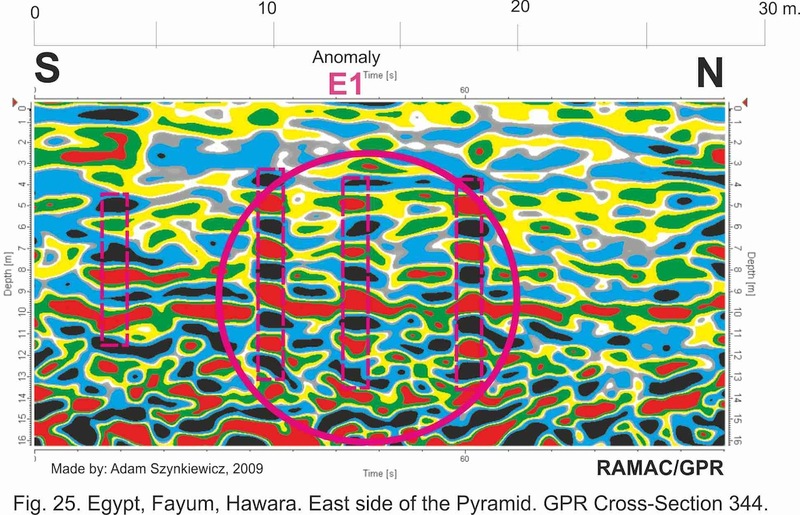 Anomalies recognized on GPR Cross-Sections are presented on Map GPR anomalies (Fig. 34). 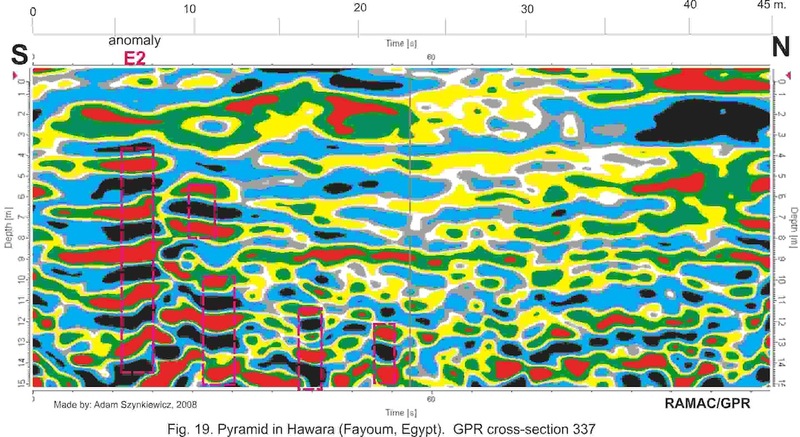 This is only schema map and localization of boreholes, GPR transects and GPR anomalies is + 10 m. Perhaps boreholes and GPR are out of pyramid construction, but GPR Cross-Sections: are made on the areas of lower part pyramid (covered by mounds). 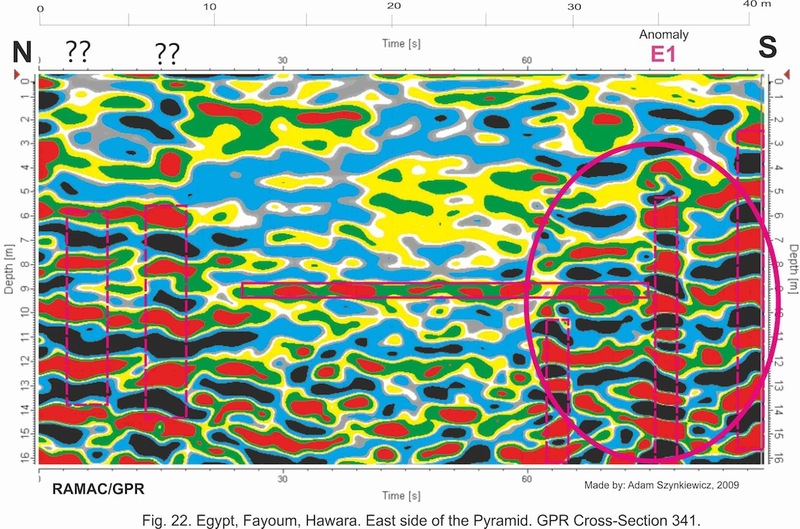 If localization of GPR Cross-Sections is correct then are few places with interesting anomalies. On the North side of Pyramid are very strong anomaly marked as N1 in central part of Pyramid, between boreholes B-6 and B-5. Other anomaly, marked N2 is near NE corner of Pyramid. Very interesting anomalies are near central part of East side of Pyramid, between boreholes B-3 and B-4 (? or near B-4). This group of anomalies is marked as E1. Other group of anomalies (E2) is near SE corner of Pyramid on East side of Pyramid. Very strong anomaly (S1) is on the South side of Pyramid, near nowadays entrance to Pyramid. 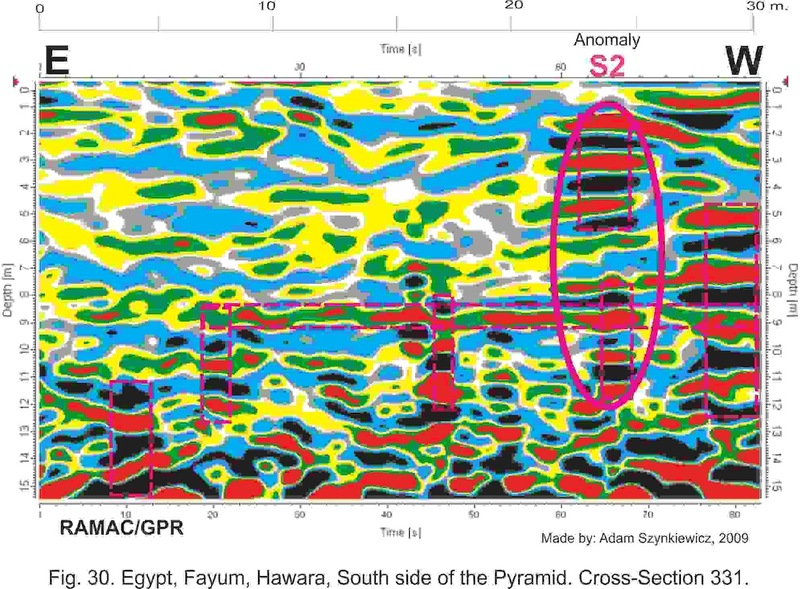 Other strong group of anomalies (S2), on South side of Pyramid, is near borehole B-2/2002 and B-I/2008. Perhaps this is tomb (?) confirmed on few cross-sections. Anomalies marked as W1 are probably echoes of the ruined walls surrounding the pyramid and the empty space between the destroyed walls. Perhaps the destruction of the walls surrounding the pyramid could have occurred while digging the Salah Cannel. The tombs, chambers, channels, etc. that exist below Pyramid were built in consolidated claystone/mudstone rocks (perhaps Eocene in age). From the West, North and East side of Pyramid the surface of these rocks (claystone/mudstone) is 1 – 3 m above water level in Selah Channel. On the South side of the Pyramid the surface of claystone/mudstone is 0,5 –2,0 m is above water level in Selah Channel. Perhaps from the West, North and East side of Pyramid existing (?) structures/walls, block inflow of ground water to chambers/tombs below Pyramid. Inflow of ground water to chambers/tombs below Pyramid is from Upland on NE and E side. Perhaps Sout-West corner of wall surrounding Pyramid or corner of Pyramid was destroyed. The destruction of the walls surrounding the pyramid could have occurred while digging the Salah Cannel. Is not excluded that during flood periods the ground water inflow was from (Bahr Wabach) Selah Channel, too. Now, the Selah Channel controls ground water level in this area. Perhaps, water in chambers/tombs below Pyramid is not only from Selah Channel. If chambers/channels/tomb below Pyramid are on depth more then 12 m below water level in Selah Channel then is possible supplying of ground water from aquifer located in underlying carbonate rocks of unit 1 (limestone). This problem should be researched separately. Chemical analysis of water from: limestone, Selah Channel, chamber below Pyramid and depression filled water on N and E is recommended. The GPR anomalies (?? 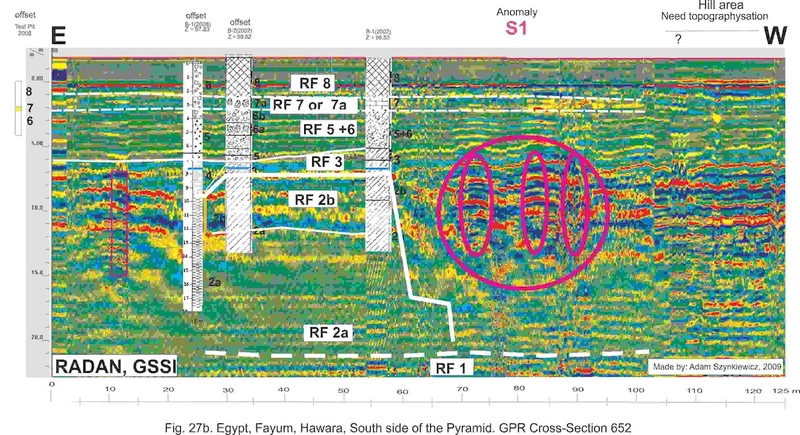 voids) discovered during the GPR research were recorded and drawing on the map of the surrounding pyramid area within a precision of + 10 meters. The most interesting anomalies are found: N1 and N2 – on the North side of Pyramid, E1 and E2 – on the East side of Pyramid. 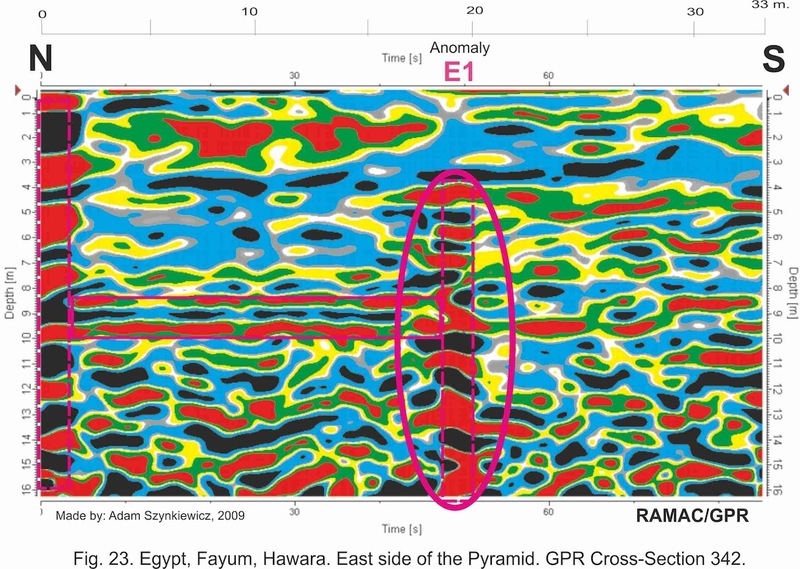 On the South side of Hawara Pyramid are GPR anomalies S1 and S2. On the West side of Pyramid are anomaly/s W1. The anomalies on West side of Pyramid need more research. Few anomalies: N1, E1, W1 appear to be possible underground water inflow areas. It is therefore believed that the results of excavations in these areas will indicate the inflow of groundwater into the pyramid. Implementation of these recommendations should bring about resolution to location of groundwater inflow and establish a program for site and pyramid restoration. voids flooded Pyramid in Hawara (Fayoum, Egypt), March – April 2008. Report I: p.: 1- 10, and Photos: 1-5 and Figs: 1-13. Order/commission: Foundation „Dar Światowida”, Poland for University of Cairo, Archaeology Department, Egypt. Performer/Consulting: Universytet Wrocławski, Instytut Nauk Geologicznych, pl. Maxa Borna 9, 50-204 Wrocław, Polska = Poland, Wrocław, April 2008.
voids flooded Pyramid in Hawara (Fayoum, Egypt), May – June 2008. Report II: p: 1-10, and Photos: 01-4 and Figs: 01-23, Tab. 1. Order/commission: Foundation „Dar Światowida”, Poland for University of Cairo, Archaeology Department, Egypt. Performer/Consulting: Universytet Wrocławski, Instytut Nauk Geologicznych, pl. Maxa Borna 9, 50-204 Wrocław, Polska = Poland, Wrocław, June 2008.
in Hawara (Fayoum, Egypt). Report III: Soil layers correlation of 12 boreholes and ground water level. Pp: 1-13, and Photos: 01-14 and Figs: 01-26. Order/commission: Foundation „Dar Światowida”, Poland for University of Cairo, Archaeology Department, Egypt. Performer/Consulting: Universytet Wrocławski, Instytut Nauk Geologicznych, pl. Maxa Borna 9, 50-204 Wrocław, Polska = Poland, Wrocław, December 2008.
in Hawara (Fayoum, Egypt). Report IV: GPR Anomalies at the Hawara Pyramid (Reinterpretation of raw data from Report I and Report II). p.: 1-16, and Photos: 01-05 and Figs: 01-23. Order/commission: Foundation „Dar Światowida”, Poland for University of Cairo, Archaeology Department, Egypt. Performer/Consulting: Uniwersytet Wrocławski, Instytut Nauk Geologicznych, pl. Maxa Borna 9, 50-204 Wrocław, Polska = Poland. Wrocław, January 2009.